Temperature uniformity within our part is achieved through correct inductor design. Inductors are often made of copper tubing – a very good conductor of heat and electricity. Inductors are usually cooled by circulating water, and are most often custom-made to fit the shape and size of the part to be heated. The GH Group has patented a revolutionary new system for inductor design and production using exclusive microfusion technology. Advantages include improved durability and increased repeatability for large scale heating processes such as hardening automotive parts. Production rates can be increased with reduced maintenance and downtime; spare inductor inventory can be reduced. Rotating Inductors are used for hardening bores of large parts that cannot be easily rotated. 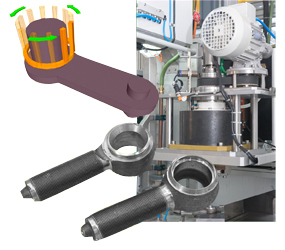 This patented system avoids the need for parts to be mechanically handled and turned. Parts are fixed while inductor rotates along the Z axis, and the hardening quality and process speed increase dramatically. Other benefits are that the machine design becomes lighter, less floor is consumed and the operation is safer.